Every boat or ship owner knows about the yearly problems caused by adhering barnacles, algae and other foreign matter. This can make the ship or boat heavier and as a result needs more fuel. Boats, yachts, ships, cruise liners, tankers and container ships need to dry-dock regularly to remove all muck, which can cost a lot of money. Our 2 component boat sealant can be of help for this problem. 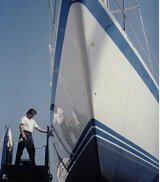 'Percenta 2-K boat sealant' is a two-component mixture based on chemical nanotechnology. Aqueous and oily liquids are simply repelled even from rough surfaces. The adhesion of mussels, algae and other foreign matter will be reduced. The surface is easy to clean and becomes more scratch resistant. Aggressive cleaning agents that are extremely acidic or alkali are not necessary. If the effect decreases, simply clean with a sponge and a mild cleaner, for example with 'Percenta all over cleaner'. The sealed surfaces need further regular cleaning, however rough contaminants, such as algae will be washed off when picking up speed.